Camelot provided 18-year-old Joseph O’Brien with his first British Classic success when obliging as the 15/8 favourite in the QIPCO 2000 Guineas. Trained by the jockey’s father, Aidan, the Montjeu colt was unbeaten in two runs last year and had long topped the market for the first Classic of the season. O’Brien junior rode his mount with supreme confidence - coming from off the pace to fend off French raider French Fifteen by a neck, with the 18-strong field spread across the Rowley Mile. Camelot’s win provided O’Brien senior with a sixth success in the race, and the colt becomes just the second Racing Post Trophy winner to follow up in the QIPCO 2000 Guineas since High Top in 1972. The young jockey, who was having his first ride in the QIPCO 2000 Guineas, said: “I was very happy and very relaxed all of the way and it all went pretty much to plan. “I was very happy and confident going in to the race and I owe a big thanks to Mr and Mrs Tabor, Mr and Mrs Smith and Mr and Mrs Magnier for giving me the opportunity to ride a horse like Camelot. He is an exceptional horse and he has proved that today. “All the stats were against him today. Everyone knew that a three-year-old Montjeu had never won a Group One over a mile and we know what good Montjeus there have been in the past. He is a very, very good horse and to win a Guineas is a big day. O’Brien senior said: “It was great and it is very special. One of those things that you don’t think will happen. “We knew all the statistics were against this horse but we knew that he is a very brilliant horse and has a lot of speed. “I had a fair idea of the way Joseph was going to ride him. After walking the course and seeing it was soft it is very rare that you can use a horse’s speed. Walking the track and Joseph said ‘Dad, at halfway I will be closer to the back than the front,’ so I bit my tongue and said nothing. “The ground was slow and although he is Montjeu he has strong influences of Kingmambo and Danehill in him, so I was very worried, but it worked out great. “I can’t tell you how privileged and how we feel to be in the position we are in - for the lads to let Joseph ride him and do everything. It is one of those special days that you dream will happen. “We always take one step at a time so we will go home and talk with Derrick, John and Michael and everyone and discuss what we are going to do but I would imagine the Derby will be his next race. We will see how he is and take it one race at a time but we will talk about it next week. “I take one day at a time. Every day you get up and are well and go to bed and are well, I am amazed as there are so many unfortunate things that happen around the world. I don’t ever take anything for granted so take one step at a time. “If we decide next week that we are going to the Derby then we will take it one day at a time. I really couldn’t believe coming here that every day we were coming here. That is why we didn’t want to say he is definitely running in the Guineas as we didn’t want to force the horse. “I couldn’t really believe that this would happen. I had myself programmed that this wouldn’t happen so that everyone wouldn’t be too disappointed if it didn’t. Everyone involved with him have done a marvellous job and it is brilliant when this does happen. “He was always looked a very different horse. When he was born he was very special, when he went to the sales he was very special, and the lads saw him at the sales and thought he was special so he has been special all of the way along. 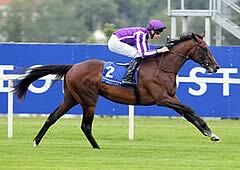 Reflecting on his son, O’Brien added: “From before Joseph could walk he has been involved in this. He has never known anything different and this has filled his life all of the way. Camelot, who was the quickest horse in the final three furlongs and who showed a cruising speed of 37.5mph from three furlongs out to the one-furlong marker, is 5/4 with Ladbrokes to win the Investec Derby and is 3/1 with the same firm to win that race and the Ladbrokes St Leger and thus the Triple Crown. Trainer Nicolas Clement was philosophical after French Fifteen went down by a neck to Camelot in the QIPCO 2000 Guineas. “I’m delighted but at the same time it’s bitter to take,” said Clement. “He’s a great horse with the heart, class and experience and it was a fantastic run. I think it was a fair result, the race was run at a fair pace and there were not too many excuses. I think the winner is a great horse. Fellow Gallic challenger Hermival was left in a small group on the far side and trainer Mikel Delzangles felt that was not to his advantage. “It was a pity he was on his own on that side,” said Delzangles. “He was left in front very early and it was just a bit far for him to go on his own. Richard Hannon felt the ground was not to the liking of fourth-placed Trumpet Major. “He (Richard Hughes) said the ground got to him.” said Hannon. “He’s run a good race and when he got into the dip he was travelling like the winner. Richard thought he was going to win three out and I did too watching the race.